Creating a successful website or blog isn’t such an easy thing. It is a hard work that requires a lot of time, creativity and imagination, a great desire to develop a business. Visual content, such as prominent details, pleasing colors, beautiful layouts, exciting images and many others, is essential for visitors, readers, and potential clients. But don’t forget that simplicity in use, navigation and contact form are of great importance, too. Efficient web design should work and bring in an income and great attendance for its owner. Having a professional-looking site or an engaging e-commerce store is the primary goal not only for beginners, but bloggers and businessmen with a great experience shouldn’t put by an overhaul. At present, readers and customers are more demanding, and expectations are high. That’s why if you want to stay in the game, create an unforgettable website, improve it, make it easy for your readers and visitors to browse a page or your products, services; add good pictures and videos, and don’t forget about changes as your blog or e-business grows. At the beginnings of 2000’s creating an online business was a complicated process. You needed to learn HTML or CSS or PHP codings. They could take a lot of time, and these codings were tricky for ordinary users. Nowadays, we are lucky to have and use CMS (content management systems) for building and developing sites. With the help of CMS bloggers and businessmen can easily forget about hiring a website designer and spending money for his/her job. It’s user-friendly and not tricky. The next question you will face with before building your blog or e-commerce site is what website platform to choose: WIX, Joomla, Drupal, WordPress. You have a splitting headache. But look at the recent statistics – 50% of the top 10 million websites prefer WordPress. Its incredible popularity is ever-increasing, over 500 sites are created on this platform every day. Are you still doubting? It suits any the website. CNN, Mozilla, eBay and even NASA use this kind of platform. Hope, you can’t stay indifferent to the easiest website platform ever. But before setting up WordPress, don’t forget to buy a hosting and a catchy domain name. And after this, you’re welcome to WordPress world. As it was mentioned before, WordPress has a wide variety of themes that will make your website unique and worthy to stay with. All of the examples are easy to install, themes have a modern design (flat or striking) and responsive layouts, etc.. Every template has distinctive features, so choose that one which responds to the wishes and purposes of your blog or e-shop project. Demo versions can help to make a right decision. To begin with, users can choose a free theme, but it doesn’t mean that it will look unprofessional or bad-made, and they can buy an elegant premium pattern. The list of WordPress samples is big enough, and you can feel like a kid in a candy shop, so use filters or write in the search specific keywords to find an appropriate one with your fantastic style. Or just entrust the testimonials and showcases of the other owners and look through the list of the most popular examples of WordPress. 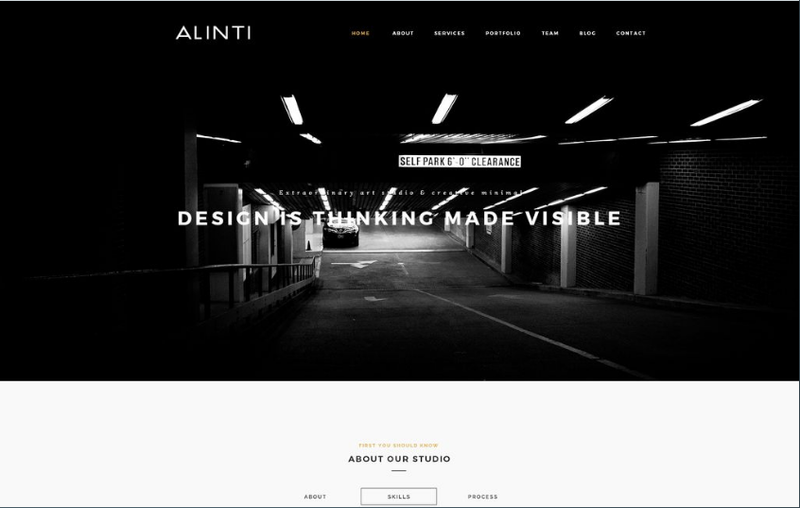 Alinti is a creative multipurpose template that is good enough for portfolios, freelancers, photographers, corporate companies and many others. It has a minimalistic modern design with different theme options (color schemes, fonts, various layout’s positions) and custom widgets. Choosing this pattern, you will also get fast page loading, good SEO results, live support for your visitors. Visual Composer, a convenient drag-n-drop PageBuilder, is built-in. Suppose, the foreign owners of this theme will appreciate the idea of having Alinti in many languages and RTL support. Add different posts, attach great videos and photos, get in touch with your clients, mark the position of your shop, office, etc. on the GoogleMaps. Everything is possible with laconic Alanti WordPress theme. One of the newest and eye-catching templates is EightyDays Theme. It is precisely that one which you can use for travel blogs and magazines. Travel agencies won’t stay aside. TemplateMonster promises a fast loading and a perfect presentation on all devices. No doubt, your website is going to attract more photo-addict users from other social networks (e.g., Instagram). 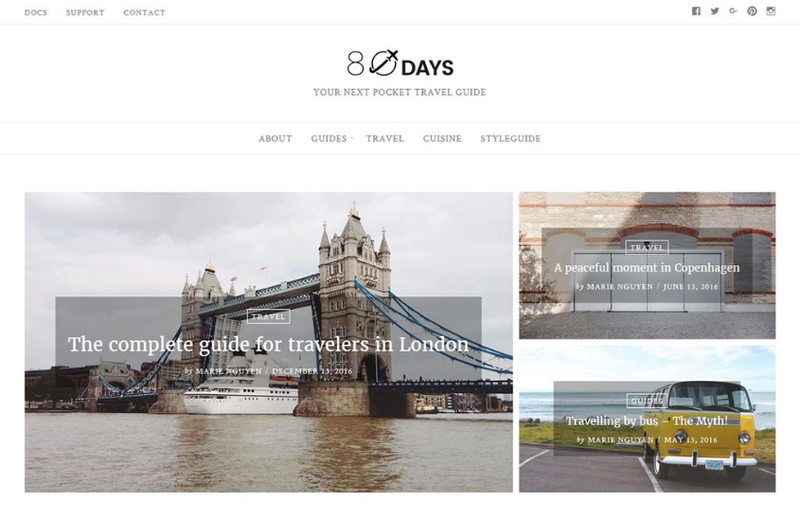 EightyDays can show all shared travel ideas and memories in a beautiful titled gallery. It offers your visitors related posts, recommends seeing the previous one from the blog or the best pictures in the Footer. With WordPress Customizer you can easily change any detail on the page or create your own design. The EightyDays template is a prominent project that puts your work in the best light. Please try, and you’ll love it. The largest bonus for its owners will be a variety of plugins such as Max Mega Menu, WooCommerce Package, Cherry Team Members and others. You’ll also be pleased with free Bonus Images of high quality and four layouts for your blog. TemplateMonster Company is sure that this powerful theme is entirely suitable for your company website. Let’s discuss here the last template – Unisco. We think the name of this educational sample speaks everything for itself. 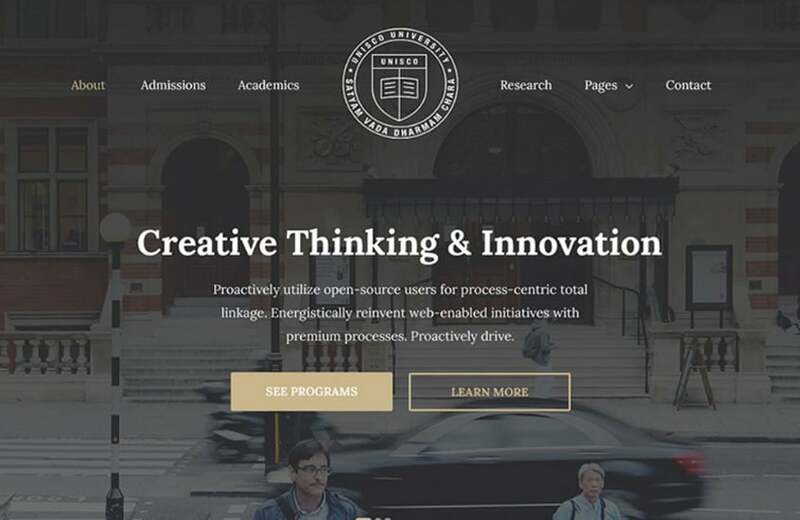 Unisco is a modern minimalistic WordPress theme for schools, colleges or universities. It also can be used for education-related business. Choosing this pattern, you’ll get various fonts from Google, an unlimited color palette in WordPress Customizer, a translation of all elements on your page and additional RTL languages, a built-in pack of courses, admissions, and events, day-and-night support for your visitors, etc. You can find more details about Unisco Theme at TemplateMonster website. Unfortunately, there are some interesting examples of WordPress templates. 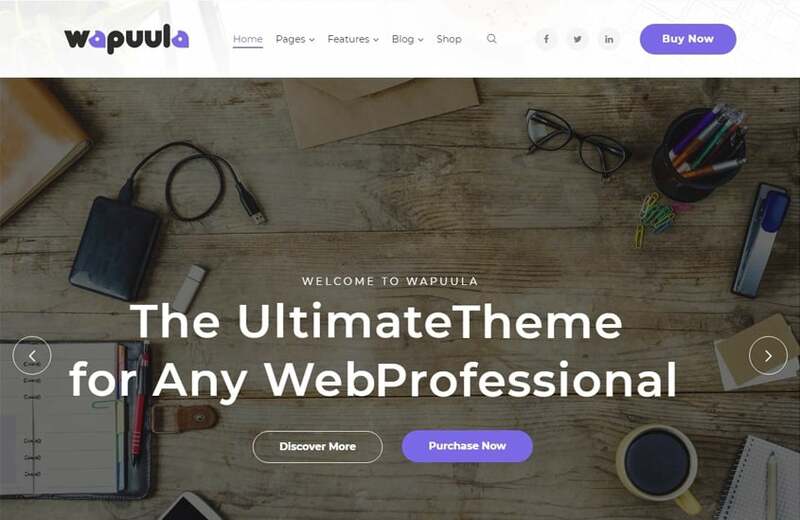 So, in case you haven’t found the option met your requirements, please check more brilliant and awesome WordPress Themes for your ideas here. Colorful but flat and clean pages with whitespace. Feel the balance. A good-looking web-design withheld grid-based layouts (arrange your content into sections, columns or boxes) and real photos or animations (make the site more vivid and engaging). An information-filled website with useful ideas. Understandable homepage and helpful landing pages. Clear navigation with logically-named categories. A call to action button (CTA’s) on nearly every page (raise your sales or attendance easily). “About us” page with some facts about you, your company or your achievements. Customers buy from the trusted websites. Contact information in one click away (easily to find). get social to find new readers and clients, hop on Facebook, Twitter or Instagram. An app instead of a mobile version for more advanced e-business, etc. Hope, all these web-design principles can help you to create a professional-looking site and inspire you for a great work. Your website is your business card! So make it in the right way to evoke stunning emotions and attract more visitors.